December! Seattle CC Insanity (Dec 31); Corvallis Winter Open (Dec 17-18) - Joshua Standig won with an impressive 4.5 of 5 points, raising his rating to 1932; Portland Game in 60 (Dec 18) - James Breckenridge won with a perfect 4.0 score; 52nd Tacoma-Pierce County Open (Dec 18-19) - Paul Bartron tied Ethan Gottlieb with 3 out of 4 points; Portland Winter Open (Dec 11-12) - Alexandra Botez was the winner with 4 out of 5; Washington Challengers Cup (Dec 11-12) in Seattle - WA state champion Howard Chen won the open section with a perfect 4.0 score; Portland Saturday Quads (Dec 4); Christmas Chaos, Spokane Valley, WA (Dec 4); Washington G/60 Championship in Tacoma (Dec 4) - tied for first with 3 out of 4 were Peter O'Gorman, Marcell Szabo and Dennis Ambler; Seattle Junior Swiss (Dec 4-5). November! Washington Class Championships (Nov 26-28 in Redmond, WA) - former WA chess champion Ignacio Perez won the master section with 5 of 6 points; Portland Game in 60 (Nov 20) - Congratulations to Steve Breckenridge with another perfect 4.0 score; Seattle Saturday Quads (Nov 20); Yakima Chess Club Mini Swiss (G/90) (Nov 20) in Toppenish, WA - Jesse Frank Clark won with a perfect 3.0, improving his rating by 200 points; Spokane G/10 Championship (Nov 20); Seattle Sunday Tornado (Nov 21) - congrats to Vik Pupols (1st with 3.5/4.0), the self-described "old Latvian swamp fox;" Seattle Chess Club Novice (Nov 13); National Gaming Day at your local library & Tacoma Library National Game Day Open (Nov 13); Tacoma Blitz Championship (Nov 12); Seattle Chess Club Extravaganza (7-round G/90, Nov 5-7) - Congratulations to Howard Chen with an impressive 6.5 of 7; Turkey Open in Missoula, Montana (Nov 6-7) - WA players did well, including co-champions John Julian and Michael Murray, each with 4.5 out of 5 points, drawing each other. Scholastic (October)! Jason Cao from Victoria, BC is the new World Chess Champion in the under 10 Open section. 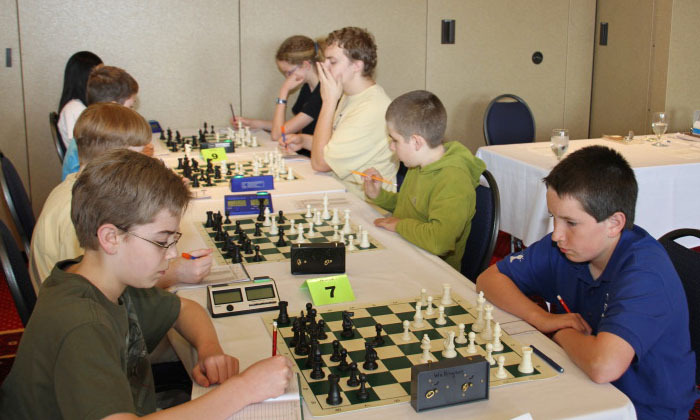 The World Youth Chess Championship took place in Porto Carras, Greece, October 20-30, 2010. This gives Jason an automatic FM title and makes him the youngest titled player in the Northwest at age 9 years, 10 months and 17 days. Other Northwest participants included Joshua and John Doknjas (BC), Sohal Tanraj (BC) and Alexandra and Andrea Botez (OR/BC). Congratulations! October! Portland Game in 60 (Oct 30) – Congratulations to Steve Breckenridge with a perfect 4.0 score, also achieving a 2202 USCF rating; 77th Puget Sound Open (Oct 30-31) in Tacoma – Vik Pupols won this 8-player event with a perfect 4.0 score – according to research reported by Rusty Miller, Vik first won the annual Puget Sound Open back in 1954! ; 28th Annual Sands Regency Reno-Western States Open (Oct 22-24) in Reno, NV; Ernst Rasmussen Blackmar-Diemer Gambit Open (Oct 23) in Port Townsend, WA – Paul Bartron and Drayton Harrison tied for first – See Rusty Miller's photos on Flickr; Yakima Chess Club Mini Swiss (Oct 23) in Toppenish, WA; Seattle Saturday Quads (Oct 16); Tacoma Chess Club at Tacoma Mall for Senior Citizen Awareness Day (Oct 16); Portland Fall Open (Oct 16-17) – Steve Breckenridge was the winner with 4.5 out of 5; National Chess Day weekend (Oct 9-10); Microsoft Giving Campaign Event for AF4C (Oct 9-10) in Redmond; Eastern Washington Open (Oct 9-10) in Spokane; Seattle Sunday Tornado (Oct 10); Portland Saturday Quads (Oct 2); Silverdale Beach Hotel Classic (Oct 2-3) in Silverdale, WA – Open section co-champions with 3 out of 4 points were Mike MacGregor, Roger Patterson and Randy Dean. September! Portland Game/60 (Sep 25); Seattle Saturday Quads (Sep 25); Yakima Mini Swiss (G/90) in Toppenish, WA (Sep 25); Seattle Fall Open (Sep 17-19) – The Open section winner was Igor Ummel with 4.5 of 5 points; Portland Saturday Quads (Sep 11); Tacoma Mini-Swiss (Sep 11); Seattle Sunday Tornado (Sep 12); Oregon Open (Sep 4-6) in Gresham, OR – finishing in a three-way tie for first (all with 5 out of 6 points) were Nick Raptis, Josh Sinanan and Mike MacGregor – See some photos on Facebook; Langley Labor Day Weekend Open (Sep 4-6) in British Columbia. August! Portland Game in 60 (Aug 28) – Nick Raptis and Steve Breckenridge drew each other, tying for first with 3.5/4.0; Seattle Saturday Quads (Aug 28); Pioneer Square Blitz Chess Championship (Aug 29) in Seattle; Spokane City Championship (Aug 19, 21-22); Robert Karch Memorial Open (Aug 20-22) in Tacoma – the winner was Daniel Hua with a score of 4 out of 5; Olympic Peninsula Rating Tournament (Aug 21) in Sequim; Qualchan Quads (Aug 14) in Spokane; Spokane Contenders Championship (Aug 14-15); Seattle Sunday Tornado (Aug 15); Yakima Mini-Swiss (Aug 15) in Toppenish, WA; Washington Senior Adult Championship (Aug 7) in Tacoma – congratulations to senior champion Mark Trevor Smith; Seattle Novice (Aug 1). Denker! The 26th Denker Tournament of High School Champions in Irvine, California was won by FM Steven Zierk of Northern California (with a 5.5/6 score); however, Alex Guo of Washington State, rated "only" 2116, took a clear second place with 5-1, losing only to Zierk! July! Portland G/60 (Jul 31) – Nick Raptis won with a perfect 4.0 score; Seattle Saturday Quads (Jul 31); Washington Speed Chess Championships (Jul 31) in Bellevue, WA – GM Varuzhan Akobian won the event with 13.5/14 points, drawing only former WA champ Ignacio Perez, who finished tied for 2nd-3rd with GM Emil Anka (10.5/14 each); GM Varuzhan Akobian Simul after WA Speed Chess Championships (Jul 31); Yakima Mini-Swiss (Jul 31) in Toppenish, WA; Seattle Seafair Open (Jul 23-25) – David Bragg and Peter Lessler tied for 1st with 4.5/5.0; Portland Summer Open (Jul 24-25) – Nick Raptis won the open section with 4.5/5.0; Run/Chess Championship (Jul 24) in Newport, OR; Chess Night with the Portland Beavers (Jul 17); LakeFair Open/Clark Harmon Memorial (Jul 17-18) in Olympia, WA – Matt Edwards won with 4.5/5.0; Seattle Sunday Tornado (Jul 18); Portland Saturday Quads (Jul 10); Tacoma Tornado #5 (Jul 10); Seattle Saturday Quads (Jul 3). June! Portland G/60 (Jun 26) – Steven Breckinridge and Andy May tied for first with 3.5 out of 4 points, drawing each other; Chess in the Park (Jun 26) in Richland, WA; ICA Summer Classic (Jun 26-27) in Boise, ID; Seattle Sunday Tornado (Jun 27); Emerald City Open (Jun 18-20) in Seattle – Alex Guo and Paul Bartron tied for first place in the open section with 4 out of 5 points; Yakima Mini-Swiss (Jun 19) in Toppenish, WA; Newport June Open (Jun 19-20) in Newport, OR; National Open & International Chess Festival in Las Vegas (Jun 10-13); 47th Evergreen Empire Open in Tacoma (Jun 12-13); Portland Saturday Quads (Jun 5); Seattle Saturday Quads (Jun 5). May! Washington Open (May 29-31) in Redmond, WA. See PDF flyer. Thanks to all the players ... there were 186 (including 16 masters), plus 35 for the scholastic event ... apparently the highest since the 244 entries in 1992. There was a three-way tie for first place in the open section. The winners were FMs Costin Cozianu, Michael Lee, and Ignacio Perez, each with 5 points out of 6. Portland G/60 (May 22) – Nick Raptis racked up another win with a perfect 4.0 score; Yakima Mini-Swiss (May 22) in Toppenish, WA; 35th Annual Paul Keres Memorial Chess Tournament (May 22-24) in Vancouver, BC – Indicative of the toughness of competition at the Keres, five players tied for first with 4.5 out of 6 points: IM Georgi Orlov, GM Manuel Rivas Pastor, FM Jack Yoos, WGM Katerina Rohonyan and Roman Jiganchine. Oregon champion Radu Roua finished with 4.0, tied with Howard Wu. All of these players are rated above 2150. Seattle Saturday Quads (May 15); Tacoma Tornado #4 (May 8); Seattle Sunday Tornado (May 9); Portland Saturday Quads (May 1); Seattle Adult Swiss (May 1-2); Inland Empire Open (May 1-2) in Spokane – Congratulations to co-winners Mark Havrilla and Avinaya Subedi, each with 4 out of 5 points in a 26-player field. April! Portland Game in 60 (Apr 24) – Congratulations to Nick Raptis with a perfect 5.0 score; Seattle Saturday Quads (Apr 24); Seattle CC Novice (Apr 25); Oregon Class Championship (Apr 17-18), Portland, OR – The winners were Nick Raptis (Open section), Alex Grom (U1800) and Hector E. Reyes (U1600); Daffodil Open (Apr 17-18), Tacoma, WA – Joseph Eversole and Roland Feng were co-winners with 4 out of 5 points; Campbell Center Open (Apr 10) in Eugene, OR; Seattle Sunday Tornado (Apr 11); Far West Open, Reno, NV (Apr 2-4); 4th Annual Grand Pacific Open, Victoria, BC (Apr 2-5) – The winner was IM Lawrence Day with a score of 5.5/6; among those tied for second with 5 points was 2010 Oregon Champion Radu Roua; see photos (Facebook users); Portland Saturday Quads (Apr 3). Scholastics (April)! Photo of some action at the Washington Middle School Championship in Tacoma. Photo courtesy of Ed McPherson. For many more of Ed's photos, see his photobucket account. The WA State Elementary Chess Championships were also held April 24 in Tacoma, and attracted over 1,200 players, a very big success! March! Seattle Spring Open (Mar 26-28); Portland Game in 60 (Mar 27) – Steve Breckenridge was the winner with a perfect 4.0 score; Yakima Mini-Swiss (Mar 27); Seattle Saturday Quads (Mar 20); Portland Spring Open (Mar 20-21) – congratulations to winners Nick Raptis in the open section and Steve Buck in the reserve section; Tacoma Tornado #3 (Mar 13); Seattle Chess Club Open House Celebration (Mar 13); Seattle Sunday Tornado (Mar 14); Portland Saturday Quads (Mar 6); Tacoma-Seattle Match (at SCC on Mar 6). Scholastics (March)! See report with some photos on the 2010 Washington Hoyt PTA Challenge, Charles Wright Chess Challenge and High School State Team Championship. Congratulations to Kate Tokareva, who won the WA State Susan Polgar Qualifier held Mar 20-21. She tied with Sarah May after 4 rounds with a 3.5 score and won in a playoff round. Kate wins $500 of travel expenses to the national Susan Polgar tournament if it occurs, or to an alternate replacement tournament to be decided. The Oregon High School Chess Team Association had 182 players battling it out over chess boards at Cottage Grove High School, Friday-Saturday February 26-27. 32 teams competed –18 Varsity, 10 JV and 4 Open. There were 23 players entered in the individual tournament. See the OHSCTA website history page for links to a full report and some photos. February! Portland G/60 (Feb 27) – Congratulations to Nick Raptis, winner with a perfect 4.0 score; Seattle Saturday Quads (Feb 27); Dave Collyer Memorial (Feb 27-28) in Spokane – Congratulations to master Satyajit Malugu, who tied IM John Donaldson for 1st place with 4.5 points; Seattle Sunday Tornado (Feb 21); Portland Saturday Quads (Feb 20); Tacoma Tornado (Feb 20); Yakima Mini-Swiss (Feb 20). January! Seattle CC Sunday Tornado (Jan 31); Portland CC Game in 60 (Jan 30) – Tied for first were Nick Raptis and Leonardo Sotaridona, each with 3.5 out of 4 points; Seattle CC Novice (Jan 30); Yakima Mini-Swiss (Jan 30) – James McAleer won with a perfect 3.0 score; Seattle Saturday Quads (Jan 23); Seattle City Championship (Jan 15-17); Tacoma CC Tornado #1 (Jan 9) and Gresham Open (Jan 9-10) in Gresham, OR. Congratulations to Gresham Open winner Radu Roua, with 4.5 out of 5 points. Finishing in a four-way tie for second with 4 points each were Viktors Pupols, Michael Pendergast, Michael J. Morris and Robert Herrera. There were 54 players in the event, up significantly from last year. Thanks to all the participants! See a report and some photos from the Washington Junior Open & Reserve held on MLK day. There is also a brief report on the Washington High School Individual Championship. Junior Champion! Congratulations to Washington Junior Closed winner Michael Omori, who won a playoff round against Michael Wang to take the championship. Both scored 4.0 out of 5.0 points in the six-player event.